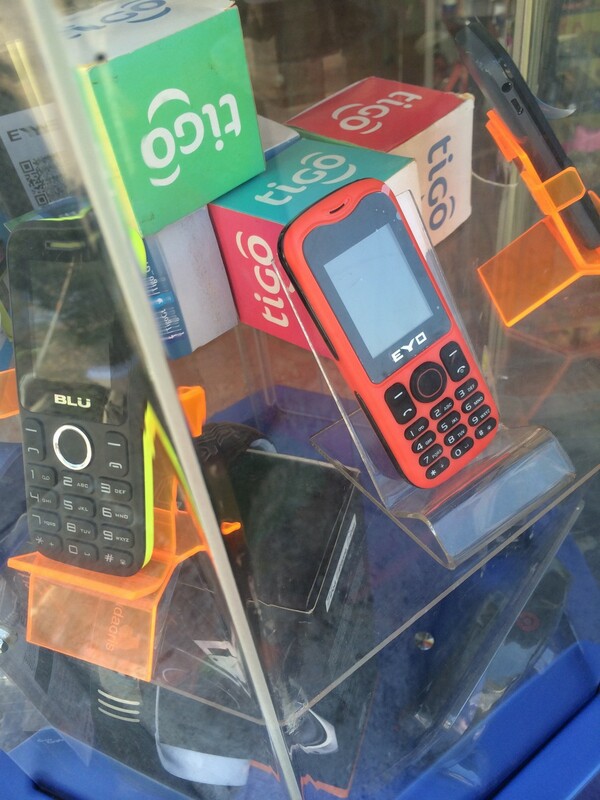 If you want a phone in Guatemala, you have a few options. The first and least desirable long term is to "Rent a phone". No, you don't actually take it home with you. This is basically a different version of a pay phone. 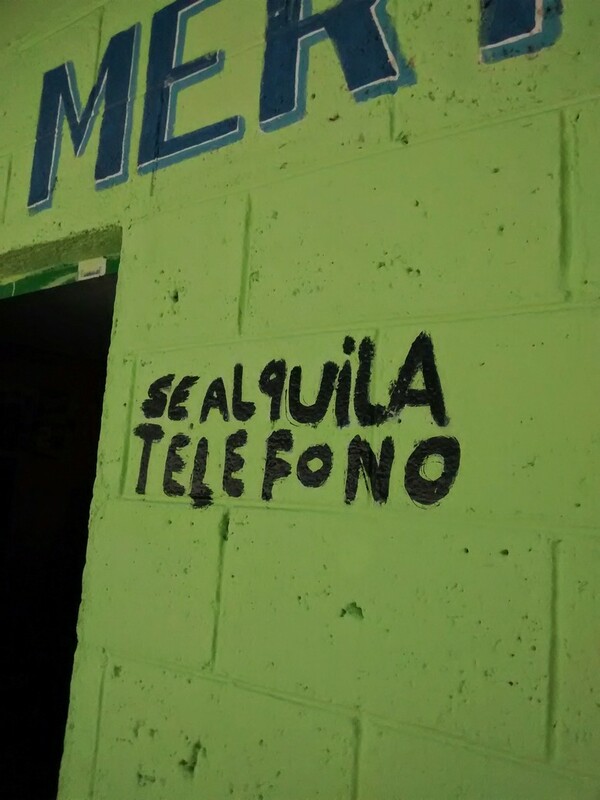 You simply look for businesses that have a sign that says "se alquila telefono". For roughly 13 cents US you can use their phone to call anywhere in the country. Need to use a phone fast? Just look for tiendas (stores) that have these words on them and you'll be set. Renting a phone may be needed to connect with someone if you are in a pinch but if you need something more permanent you'll have to look elsewhere. A company called Claro provides landline service in our town but due to limitations in physical infrastructure (the amount of wires in the ground or on poles) some parts of town can't get this service. But, who wants a landline anyway? Just like in developed countries, cell phones are where it's at. Cell phone service first began to pick up steam in Guatemala around the year 2000. Since then it has transformed the way people communicate. Prior to this time remote towns/pueblos might have one or two phones in the entire town. Now everyone in the entire town is likely carrying there own phone. This chart depicts how fast cell phones took off in Guatemala. Source. Today Guatemala has a population of about 15.5 million people and an estimated 21 million active cell phones. That's how popular cell phones are here. You are probably thinking, wait a minute Guatemala is a poor country how could this be? Cell phones and their plans are expensive. How could there be more phones than people in a country like Guatemala? To start, most locals don't have iPhones (but some wealthy ones do). Most locals have basic feature phones. No touch screen, no or a really bad camera, etc. These phones can be bought for $10-$20 US in Guatemala. These are some of the mid-lower end phones that are commonly used if someone needs to buy a new phone. 1) If you are out of saldo it means you can't make calls but you can receive them. A lot of people have phones but don't have saldo. You call them when you need to get in touch with them...they won't/can't call you. 2) Saldo goes on sale very commonly (about every 5-10 days). The days are not previously publicized. They are announced the day of. If your phone allows it, you might get a text message from the provider telling you about the sale or a quick walk around town will let you know via signs everywhere. The trick is not to run out of saldo on a non-sale day. 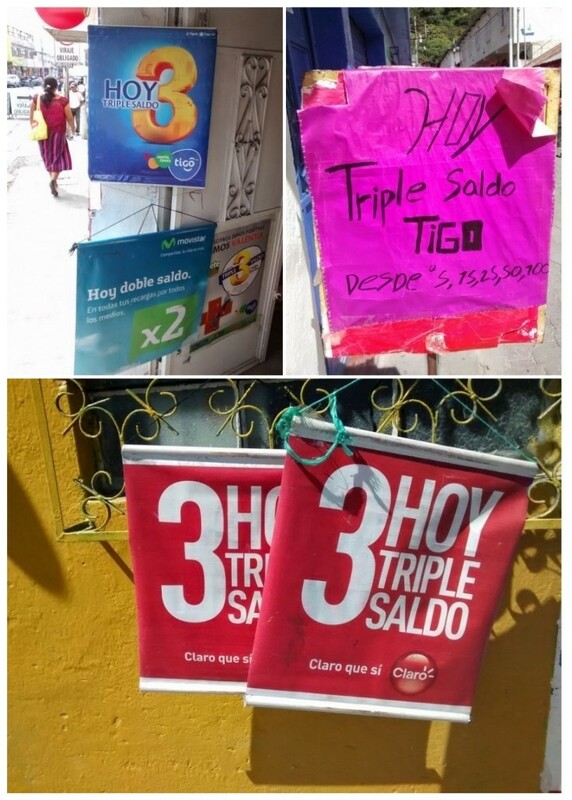 Examples of 3 for 1 or triple saldo sale signs. The last thing to know about saldo is that some sales (like the 6 for 1 sales) have expiration dates on the bonus saldo so you have to ask in advance or read the fine print. As for quality of service, we use the provider Tigo and the voice quality is as good as a US based operated. The availability of service is also very good. We've been on hikes/runs on remote farm trails and still had 4-5 bars of signals. For calling friends and family in the States we use Google Voice or Google Hangouts. This free service is a must for any expat traveling abroad. It's totally free for us to call the US and we get a free US based phone number for people to call us on (so they pay no international fees as well). It works over wifi and there are free apps for both Android and IOS. No saldo required.